Rec. Albany Mus. 1: 92 (1903). Origin and Habitat: Eastern Cape, South Africa. Habitat ad ecology: Albuca circinata grows in sandy soil along the coast in Southern suburbs of Port Elizabeth to Sardinia Bay Nature Reserve. Flowering November-March. Description: Albuca circinata (Coastal albuca) is one of the local or morphological form of Albuca namaquensis that shows a wide range of natural variability. Albuca circinata grows from bulbs, and has a dormancy period after flowering whereby it lose its leaves. The flower scape is unbranched up to 350 mm long. The graceful flowers are nodding or pendulous in shades of green and pale mustard, they are very effective and worth grow. Bulb: Globose, sitting partially on top of the ground and cluster-forming, tunics white membranous. Leaves: Several, grass like, arising from the bulb, 15-23 cm long, 2 mm on diameter erect, glabrous nearly straight to very curly with coiled tip (The degree of spiral depends on the clone and the amount of sunlight the plant receives when the leaves started growing). Inflorescence (raceme): Peduncle hairless enlarged near the base up to 35 cm tall. Raceme dense few flowered, pedicels erect to reclined 12-18 mm long, bracts ovate, pointed. Perianth campanulate 12-16 mm long. Outer tepals ochre with olive-green keels, inner tepals oblong bright yellow to dull yellow green with green keels. All the stamens bearing anthers. Style prismatic about as long as the ovary. Smells pleasant. 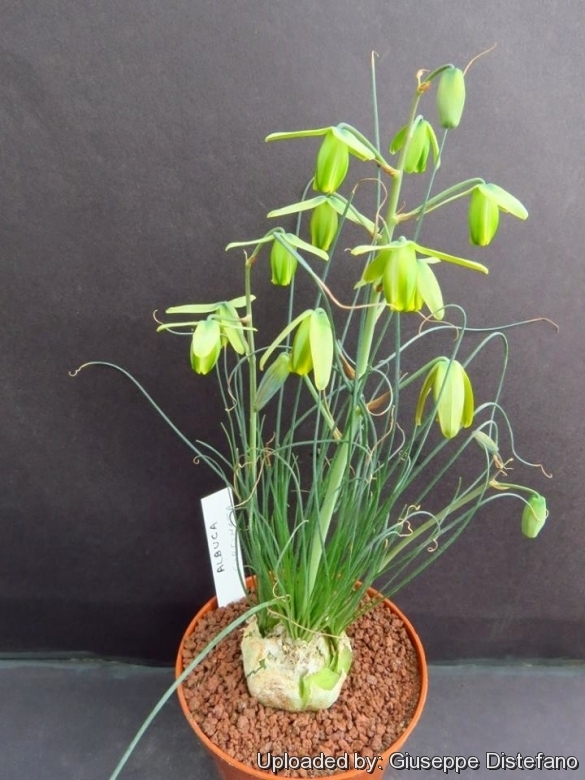 Cultivation and Propagation: Albuca circinata comes from the winter rainfall regions of south-western Africa, producing its miniature whirlwinds of leaves in early winter. The leaves usually curl better if given good light. It would probably look even better in a hot dry environment. It is one of the most difficult members to cultivate successfully over an extended period. It is a winter-growing and summer-dormant species that needs to be kept almost dry during its dormancy as the bulbs is disposed to dwindle and rot. Its summer rest must be absolute and does not initiate new foliage until the cooling effects of autumn. This plant may or may not have foliage in the heat of the summer. If it does have foliage, during the hottest part of summer, the foliage and plant may look ratty but as long as the bulb is firm the plant is in good health and it will improve in appearance once new foliage initiates in the autumn. A great plant for the southern rock garden as well.